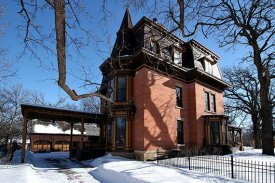 Thorwood, a National Register 1880 French Second Empire mansion, is tucked into a historic neighborhood just a block from the Mississippi bluff and five blocks up the hill from historic downtown Hastings. Thorwood was built by a lumberman as a 10,000 square foot private home in 1880 and now is restored beautifully to three condos, two elegantly offered as a home away from home for vacationers, business travelers and retreat seekers. 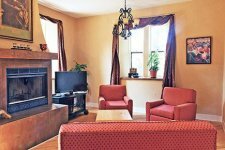 Thorwood vacation condo rentals boast gourmet kitchens, an abundance of fireplaces and a private elevator in each. 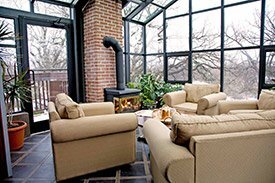 Either of these two condos, the Penthouse with its rooftop solarium or the Lumber Baron with its elegant parlors, provide the perfect Hastings MN lodging experience. Historic Hastings, with its small town warmth coupled with an abundance of natural waterways (three rivers and two lakes), make the Inns and town seem like a far away oasis. Yet Hastings is only 30 minutes from St. Paul, Minneapolis, the International Airport, The Mall of America, Red Wing and Stillwater. The most spectacular geography here is the confluence of the St. Croix and Mississippi Rivers. Bluff views of the St. Croix can be enjoyed from Carpenter Nature Center with its 300 acres and 15 miles of trails and apple orchard or from Freedom Park, a Wisconsin State Park in Prescott just 5 miles from the inn. Then Schaar’s Bluff, a Dakota County Park with amazing bluff views and trails is an amazing spot to catch the sunset and the perfect spot to pop THE question according to many of our guests. There is birding, boating and biking. The nature center’s bird list is 180 strong with at least eight eagles nests counted in the area. The bike–hike trail in Hastings is 15 miles with 12 miles along waterway. 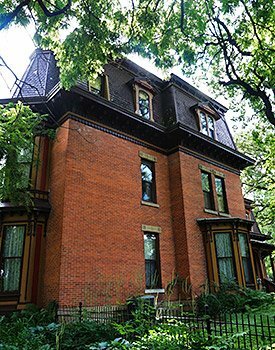 Historic downtown Hastings hosts an antique car show every other Saturday through the summer and The LeDuc Estate, seasonally open for tours, is said to be the most romantic example of gothic architecture in the nation. Wineries and orchards abound and we are lucky to be surrounded by eight golf courses and two ski areas (Welch and Afton Alps). So it is your choice - come and be inspired by the natural beauty and adventure in the area or come and snuggle in at your elegant home space and acknowledge the true beauty of doing nothing. Best stay in this part of the state! My wife and I stayed here for over two weeks while doing business in Hastings. We stayed in the penthouse condo during our visit. The atrium allows sitting "outside" watching the thunderstorms and sunsets up among the oak trees. The owner/operators are quite pleasant and accommodating. We recommend staying here for extended visits. It beats anything for 50 miles around in comfort and value.